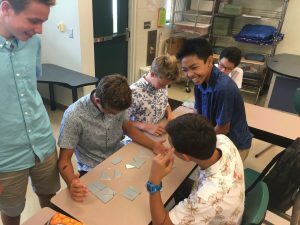 Although this post is coming a little late, this is a reflection about our work in our MPX program for the second week of the school year. Not surprising, most teachers spend some of the initial time with their students setting the context for what they are doing. We take time to establish our norms, have students understand our routines and rhythms of the class so that we make it possible for them to work efficiently and to stay on task when they are with us. In our work with MPX, we did a few things that set the context for our work. It struck me that the quote that the title is based on (which is from Lewis Carroll) kept coming up as we were working with our students in these first few weeks on our mini project on conflict resolution in society. Let me give three examples of how this played out in our work this week. 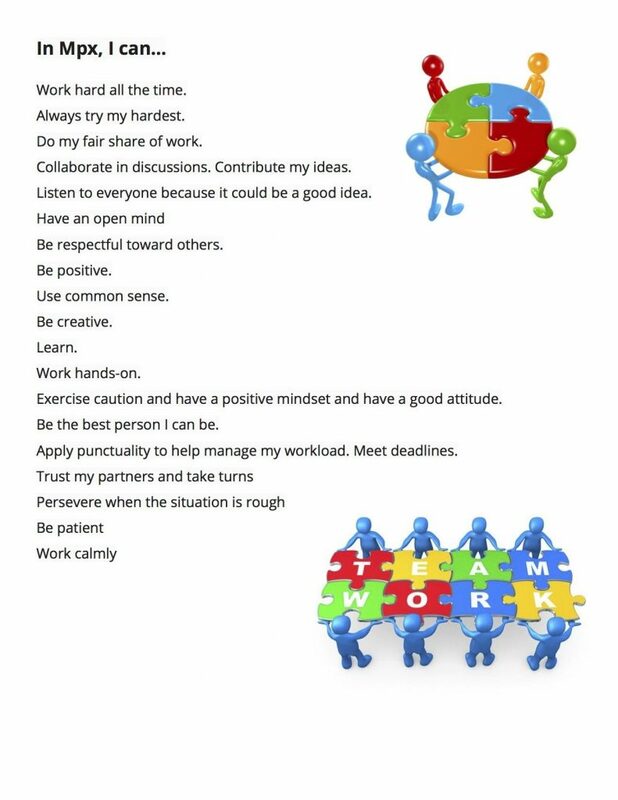 We took time in our class to have the students consider what are the kinds of behaviors, attitudes and beliefs we bring in when we work as a class. We did a co-construction activity where the students offered ideas, and then we distilled those over 100 thoughts down to 19 key statements that they made about what it means to learn in our class. The key thing was to make sure the words were theirs, since our goal is to give them feedback and hold them to these agreed-upon expectations. One of the beautiful things about having these posted clearly in the room is that we can proactively challenge and point out to the students that these are the things that powerful learners do. It acts as our roadmap to a class culture that will move us forward productively. – and lastly clear criteria that we have agreed on about what the end should look like. The language from this came from our own research, from looking at quality examples, and by using expertise to help us make decisions about what goes into good storytelling. 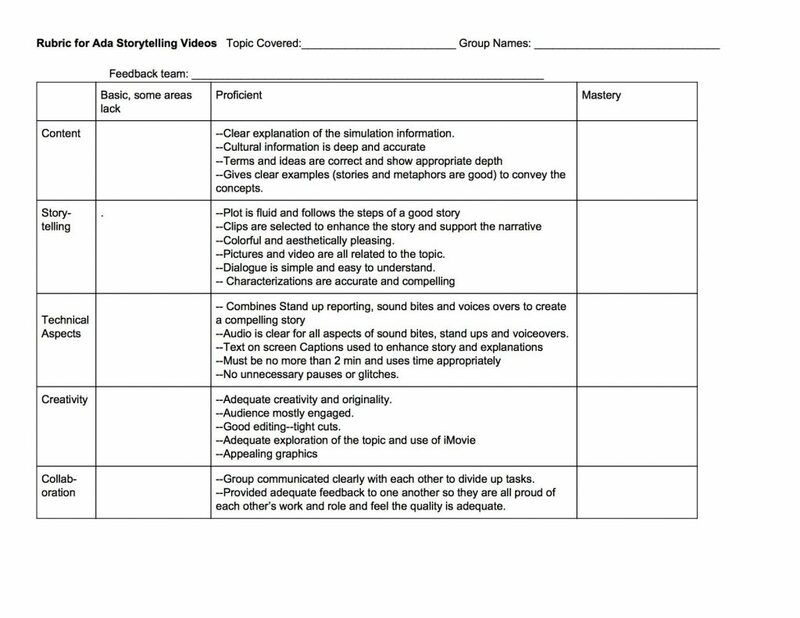 The students used this rubric to give each other feedback multiple times, and it was used in the final assessment as well. At the start of any project, we give the students a map out of what that project will unfold like with clearly defined goals, an essential question, an outcome that is important and challenging and the steps that are required to get there laid out with enough detail that they know what needs to happen to get from the start to the finish. 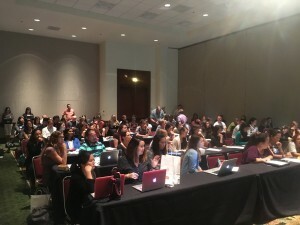 When we do our professional work with teachers around the state, this is the key thing that we tried to instill in those teachers – that without a roadmap and clarity around the means by which students will have time to understand, give feedback and reflect on their learning, the likelihood of getting to the end is drastically less. 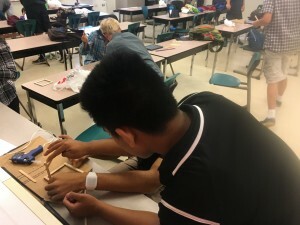 We have seen many teachers talk about how they have implemented projects, and only a few or some of the students “got it” and produce a product that they had hoped for. More often than not, it is not a fault of the students, but lack of clarity of the roadmap on how to help them get there. Well here we are at the end of our first week of school. 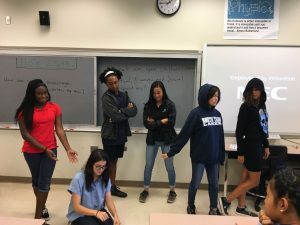 Our most excellent MPX 9 team (John, Bob, Chris and myself) had decided back in July to start the year with a small scale project that would have the students look at societal conflict through a role playing simulation. 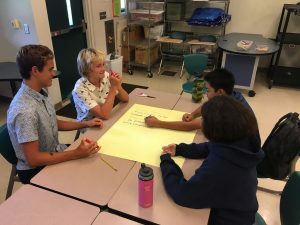 It would give them a chance to experience a mini form of a project, lets us scaffold some of the baseline agreements we need (group norms, reflective blogging, storytelling, etc) and have a product in time for Back to school night on August 24 for our parents. MPX 9 Teaching Team ready to go on Day1! 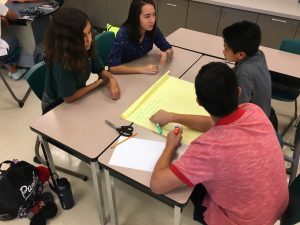 After some opening activities with students getting to know each other and us, we jumped into a group problem solving activity to have them work together and start thinking of what effective groups have in common. The students set up their blogs and other tools like Showbie to allow us to have a class workflow. By the second day of class they were into the societal conflict simulation and were also developing norms for group work and reflective blogs. Chris Falk and I ran class together and it was a lot of fun having all 42 students in class together! 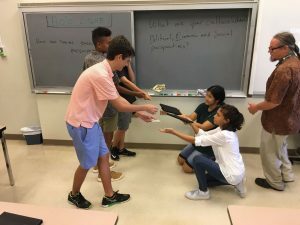 42 students together for conflict simulation – mayhem! 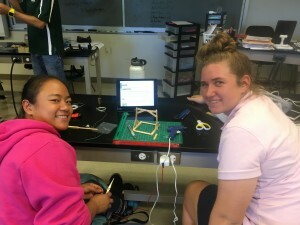 Since we wanted students to work with video for the project, we had them do a STEM challenge of building a bridge with popsicle sticks so they could capture video and images to create a short movie. 109 Shawn Kalei Kahookele from GWN Storytelling on Vimeo. The Students finished the week planning a bit for their videos they will be making next week and reflecting on their learning from the week. We are off to the races! We are excited about the great work the students will do this year. 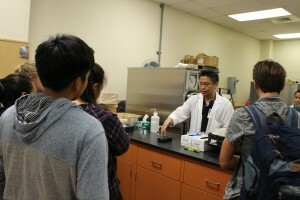 Our MPX 10 students were blessed to have a visit from a Mid-Pacific alumni: Yoh Kawanami c/o ‘97. 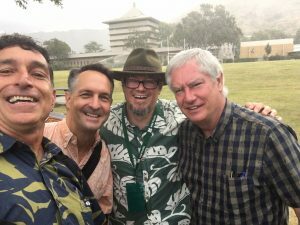 He is currently the Director of Demand Response Programs at Hawaiian Electric Company (HECO). 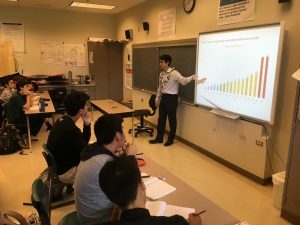 Koh reached out to the school through his work with HECO and in particular with his interest in sustainability, resource management, and global interdependence, especially Japan and Asia. 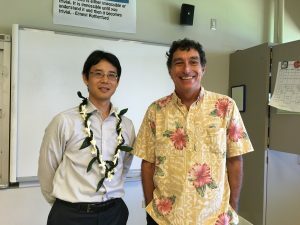 He agreed to come and meet the students, and gave us a presentation on energy sustainability with an emphasis on the challenges facing HECO with their work to move towards better resource management and the eventual goal of energy interdependence by 2045. 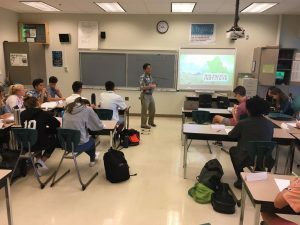 Over the course of his talk with the students he shared his pathway after leaving Mid-Pacific, going to the University of Washington, and then to Duke before relocating to the islands to do work in Department of Defense and engineering resource management. 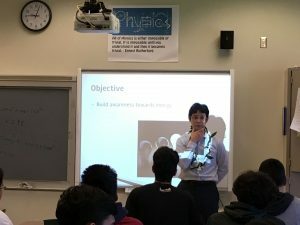 The students were very appreciative of him sharing his knowledge and passion around this topic and our hope is to continue to connect to the work he is doing in the community. Yoh explaining the energy consumption profiles of different countries. Yes – the US is the Red bar on the right side! My friends and my family know that I spend way too much of my expendable income on dining experiences – not casual affairs, but going to interesting places and trying out new chefs in town when I can afford them. I also love cooking and my own kitchen, constantly playing with new recipes or adapting old ones. 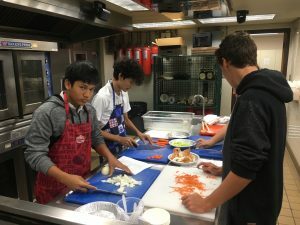 It’s no big surprise then, that I’ve always had it in my mind to figure out how to bring cooking into my students’ experiences. At so many levels this is such a important experience – research shows that families that cook and eat together have deeper relationships, healthier diets and also save money at the same time. 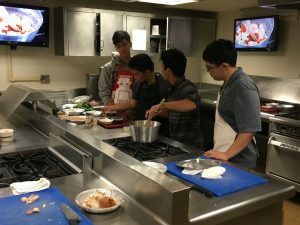 Were living in a society in which “prepackaged” and “to go” are the main means that many of our students understand eating, and yet for most of society’s history food and cooking has been at the center of culture, interaction, and identity. 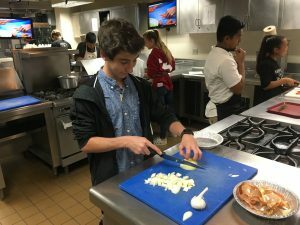 Moreover, the science of cooking is deep and powerful and cuts across many disciplines – physics, biology, health and nutrition, chemistry, sustainable science, environmental impact… the list goes on. So how do we make this happen in our classrooms? How far can we go with this to both engage our students and still have a safe learning environment? 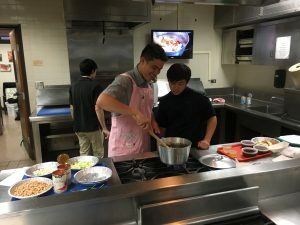 We have been blessed over the last four years to work with a wonderful community partner: the Culinary Arts program at Kapiolani Community College (KCC). We have coordinated projects with them dealing with sustainable agriculture, food to table and cooking classes – but in the past these were focused on life sciences as our primary core standards. 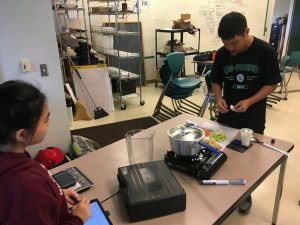 Our wonderful friend and colleague Daniel Leung from KCC helped us to design a project this semester that centers on cooking and thermodynamics. The underlying science of this includes heat and temperature, radiation, convection and conduction, and the first and second law of thermodynamics. Additionally, there is a wealth of information about the chemical phenomenon that happens around the process of cooking food including the way that plant and animal cells behave differently, how proteins work at different temperatures, and even the important Maillard reaction. 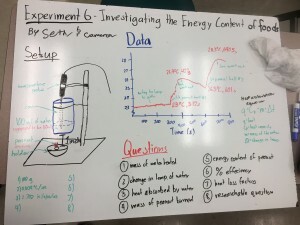 We mapped out a set of experiments and activities, readings and hands-on work that would allow our students to investigate this deeply and tied to our energy standards in our physical science curriculum. 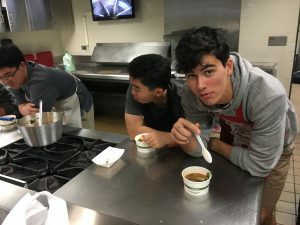 Over the four weeks of this project, our students will visit the KCC kitchen classroom/lab to prepare both Tuscan bean soup and a dish to be still decided – but something that involves braising and the three different types of heat transfer. In class we are doing things as simple as looking at the effect of different metals in the way they transfer heat, to the way that cooling happens, through looking at the heat capacity of different materials including food. 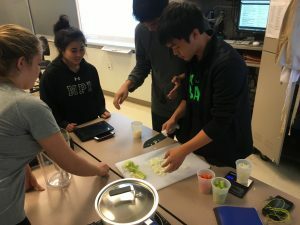 In the end, two of the outcomes will be our students cooking a meal for their family and explaining the science behind it and the creation of a five-minute video in which they explain the science behind a particular cooking technique – modeled after the widely known show “Good Eats” with Alton Brown. This first four-week unit we designed is the starting point for us expanding on this idea next year to create a deeper look at food, science and culture. We are excited to see where this will take us but we know it’ll be fun and powerful! Here’s to good food, good science, and powerful learning! Cheers! We received training on prep use of knives as well! One of the great pleasures and challenges of doing real deeper learning work is finding real challenges in our community and community partners that can help us become part of the work in working towards a healthier, safer community. Some of our classwork this year centered on science standards in chemistry, which lend itself to looking at the water issues in our community. The island of Oahu is really a perfect water catchment system, and in particular almost all of that water resides under the island in aquifers that hold freshwater that filters down from the 1.8 billion gallons of rainfall that occur on the island every day. Many of us that live here sometimes take this water for granted, but if we go just a little deeper into this resource, we see that there are important challenges that are facing the island, and a real need for stewardship of these critical resources for us to enjoy the quality of freshwater that we have become accustomed to. 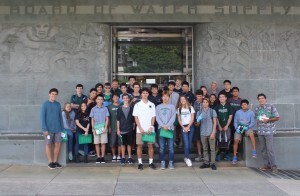 On December 2 our class of 10th grade MPXers visited the Board of Water Supply (BWS) to learn more about when, how and what gets tested to ensure the safety of our water. Before we visited the site, we spent time reading through the resources about what the board of water supply does, and in particular some of the challenges that they face. 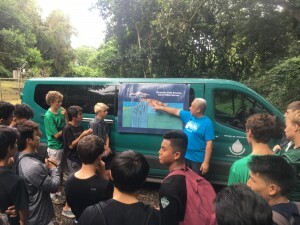 I shared slides from a community meeting in October that detailed one of the most pressing issues in Honolulu, In particular, there is a situation with the water that comes out of the Halawa shaft (http://www.boardofwatersupply.com/community/tours-education/halawa-shaft-underground-pumping-station) which feeds water to one quarter of the island’s population. There are large jet fuel storage tanks that hold upwards of hundred 87 million gallons of jet fuel just 100 feet above the aquifer. 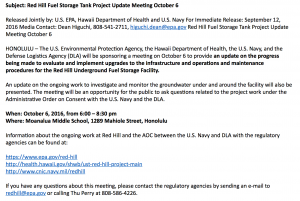 There is already evidence that these tanks have leaked, and there is continuing tension between those who feel the tanks need stay where they are because of security concerns, and the community that feels that it endangers its water supply. Our visit to the BWS allowed us to observe, deepen our understanding and ask questions about this key issue. 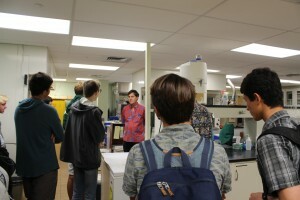 The folks at the BWS were gracious in opening up their labs and sharing the process they use to test and ensure water quality for Oahu. What role can we play? The Honolulu City Council has met with us and asked us to help them better understand the ins and outs of this issue. They worry that they don’t have a good enough understanding of the science of the water and what and how it might be tested and treated. Our class will be diving in to understand this problem and helping the city council to better see the issues and what they can do. The goal is to present our findings to the council in April and share our learnings and recommendations. It should be an exciting exploration in an important actionable issue in our community! Here in my 35th year of teaching, I think about some of my early experiences in my role as a teacher there was a lot of emphasis on What (scope) I taught and how it fit into the learning path of students (sequence). Most curriculum documents and textbooks are structured to map out the scope and sequence of a course of study. What often is left as an afterthought, or at least as a secondary action is How (pedagogy) that Scope and Sequence is delivered and by what means we assess success. In 2012 I gave an Ignite Talk that was titled “Mobile Technologies & Personalized Learning: A quest to make thinking visible and technology invisible” (Slide Deck here). As a part of that talk, I emphasized that technology and pedagogy play an important role to move learners to a more personalized, powerful and lasting learning experience. The overlapping of Content, Technologies (tools), and Pedagogy is the place where where learning can be shaped. 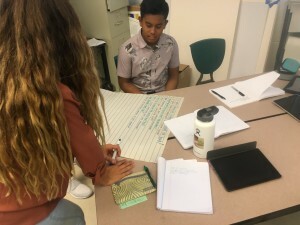 In our work in the Mid-Pacific eXploratory (MPX) program we spend as much time planning for how students encounter their learning as we spend looking at what they will be learning. For example, in our recent work, we have our students designing and building trebuchets for a project we call “Santa’s Little Helper”. 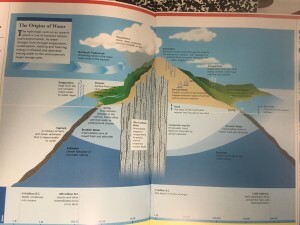 Although the underlying content is from the Integrated Science 1 in the Next Generation Science Standards (NGSS), our goal has been to create the conditions under which the students have an opportunity to create, make decisions, iterate, explain their work through real world activities and build in design and engineering as a part of the process. time, opportunities, routines, language, modeling, interaction, physical environment and expectations (more information here). Note – none of these forces are the scope and sequence. However, they are just as important a component in the instructional design process for learning. In an earlier blog post, I discussed the “Pebble in the Pond” which is an instructional methodology that looks at whole problem learning. There are other frameworks that are structured like this – whether it is Wiggins and McTigue’s Backwards Design in UBD, the Buck Institute’s Gold Standard for PBL, or the TPACK framework for 21st-century learning. Back in the 1990s when I was working with the ASU modeling instruction program for science education, it was impressed upon us that we were not learning a curriculum, we were learning a pedagogy of scientific inquiry. In much the same way, the work that we continue to do in our MPX program reflects that idea – that it isn’t just about what we learn (scope and sequence), but it is also important to consider how we learn. The teachers at our “Devil is in the Details” Schools of the Future presentation. Utah State University. His “First Principles of Instruction” is a thoughtful, deep, powerhouse work that goes very intricately into best practice instructional design principles for learning. 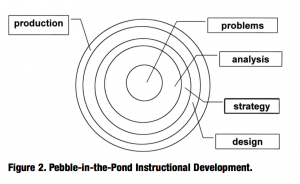 One of the articles we read when we worked with him was “A Pebble in the Pond Model for Instructional Design” (http://mdavidmerrill.com/Papers/Pebble_in_the_Pond.pdf). 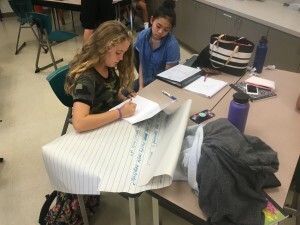 In that model, the critical components include making sure the learners know and understand the whole problem before launching into their learning, that components skills and knowledge need to be broken into a series of scenarios or events that help the deepen their understanding of the parts that will move them towards the whole problem. He also talks about phases of instruction that are very similar to the mantra “tell, show, do” which is the basis of most kinds of powerful learning, but the “do” often gets left out in traditional education. Centered around the problem, what are the elements of effective instruction. Note that the PROBLEM is in the center! – Good design is good design. It isn’t enough to teach component skills. If we want learners to be able to utilize what we are teaching them, we need to put problems in their context, have them understand the whole, and build up the component skills they need in order to successfully utilize that information. – This kind of pebble in the pond design work is highly compatible with deeper learning practices like PBL. There is a quote from the Ancient Mariner by Coleridge: “Water, water, everywhere, Nor any drop to drink”. One of the continuing investigations for us this year is the issue of water. It ties nicely with some of the physical chemistry work that we are trying to do. Water has so many wonderful properties that make it special, including life on earth itself. The chemistry of water and its role in society provide so many different ways that we might approach it. Today, our work centered around our community water supply, where it comes from, how it is distributed, what are the ways that the Native Hawaiian people viewed this, and probably most pressing: is it safe to drink and is it secure? 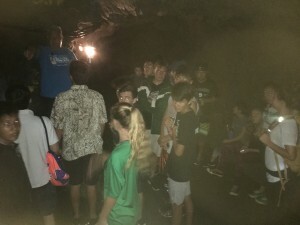 We took a field trip today to the Waihee Water Tunnel (info here). We were ably guided by Arthur Aiu, community relations specialist for the board of water supply. 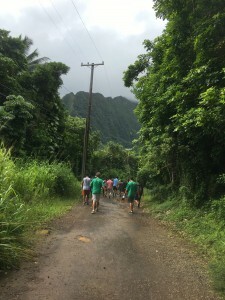 After a 1.5 mile hike in, we entered a tunnel that extended into the mountainside for over 1/4 mile (1500 feet) and came upon the water that is directed to most of the communities on the windward side of the island. The graphic below gives you a sense of where the water comes from. 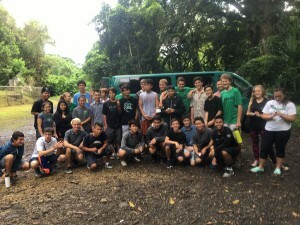 The purpose of this post is not really to teach you about where our water comes from, but it’s worth mentioning that Hawaii is really a special place in how the conditions of weather and mountains produce large reserves of water that are located both in compartments in the mountains called Dikes, as well as aquifers below the island that hold water. 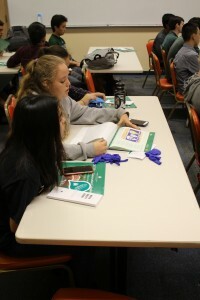 The students learned about how the water gets there, how it’s removed, why it’s handled the way it is and even what safety concerns there are about water quality and how the board of water supply manages that. 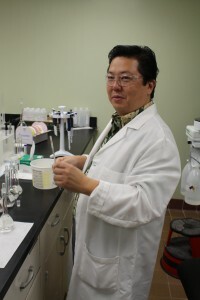 For example, Arthur mentioned that all water on Oahu is treated with small amounts of chlorine to control for bacterial growth – that’s something that I had not been aware of, but we know from our chemistry work the reactive nature of chlorine and students should have been making the connection to why chlorine is such an ideal substance to interact with living matter to break apart contaminants. In other parts of the island where the water has become more contaminated from organic pesticides, activated charcoal is used. 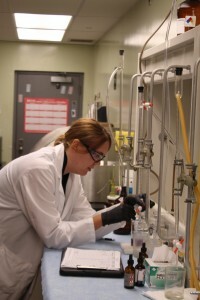 Another example of chemistry helping keep our water drinkable. As you can see from the pictures posted below, and more here (Flickr account here) the water literally filters down through the rocks and drips through the fissures that have occurred through different volcanic events that have happened over time. 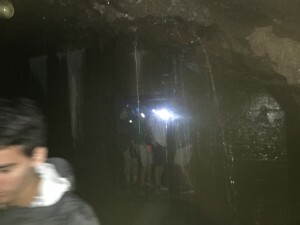 The water that we were observing only takes about nine months to filter from the rainfall down through the mountain to these caverns, although it takes 25 years or more for the water to filter all the way down to the aquifer located below the island. The challenge for the students was to really consider how do we protect and ensure this precious resource since all we can plan to use is the water that we have here on the island. I have been challenging myself in my work in MPX to think more deeply and purposefully about how to move my learners into habits of mind of their discipline. Last year when math (Alg 2) was part of my work I really tried to drive in to the habits of mind of mathematicians. 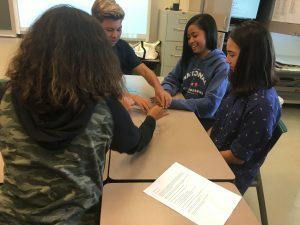 This year we realigned our curriculum and my focus has been in NGSS (Next Generation Science Standards) – particularly Integrated Science 1 which has topics in physical chemistry. The work I have been developing harkens back to my first year teaching (1982 – was it really that long ago?) when I was working with 8th grade students teaching a program called IPS (Introductory Physical Science). In the summer of 1983 I attended a 2 week workshop run by Haber-Schaim on the pedagogical approach to teaching IPS. 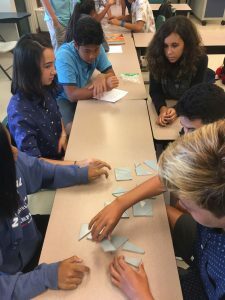 I was too green a teacher at the time to appreciate all the depth and complexity of learning theory they moved us through that summer, but I know it left a lasting impact on me because now I know what to call it – constructivist learning. I realized while I am writing this I still have that lab journal somewhere and I should go and pull it out because I am sure it is full of gems that I could rediscover and still use in my students’ work. Let me take a few key ideas that I learned form that experience that still are part of MY DNA as a teacher, though reinforced, elaborated and creatively redesigned in my new “Hines 3.0” teaching framework as we develop our MPX program. One of the ways to drive an important question or to gain attention is by exposing something we don’t understand well or at all. In the words of the modeling pedagogical approach that came out of the work of Wells and Hestenes ( http://modeling.asu.edu) we need to displace learner’s naïve theories with more complete ones and one of the ways to expose that is by showing them an event that doesn’t play out the way their naïve model shows. 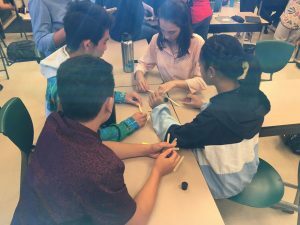 In the IPS curriculum, the first event the students are exposed to is the decomposition of wood splints into its constituent matter (solids, liquids, gasses) which drives a semester long investigation into understanding better what wood or truly any matter is fundamentally made of. At its core, the entire course was based on a critical essential question that came from the discrepant event mentioned above. In a sentence, it was “what is matter made of?”. 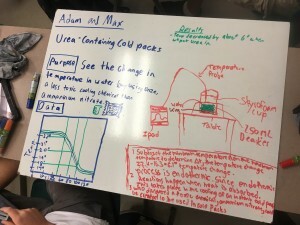 All of the experimental designs and all the community building that happened after that was to come up with a high fidelity model of matter based on experimental work that the class conducted day by day, and week by week. 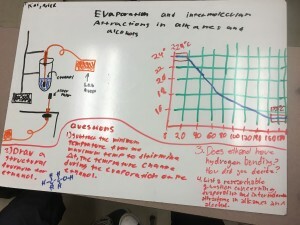 In so much of traditional curriculum including science, there is a focus about memorizing the answer from experts, whether it is Newton’s second law of motion, or what events led to a important historical juncture. 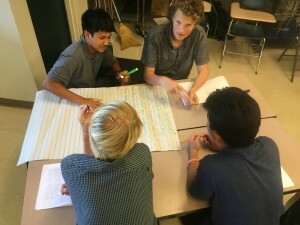 The role of inquiry at a deep level is to allow the students to form the questions and reach their own conclusions – certainly scaffolded or shaped by the expert (teacher) knowledge and experience, but in a well-designed learning environment, it is the learner who constructs the knowledge, not dished to them by a teacher, text, or other expert. Ultimately, that is what displaces their naïve theories, because it is formed and informed by their experience and active decision-making. As a learner moves from a naïve thinker to an expert thinker, they inherently begin to own the habits of mind of that discipline whether it is scientist, mathematician, historian, writer, etc. This is not taught passively, the learner needs to walk the walk and do the work of the discipline. No more than you would want a medical doctor treating patients who had not gone through a series of apprenticeships in which they were with actual patients under guidance challenging themselves to address many patients’ health needs to build the right kind of thinking and decision-making that is inherent in their discipline, we need to put students in our classes in those same shoes – developing the essential questions, designing the experiments, making meaning of the data, coming to generalized agreements and reporting it in a way that indicates a deep satisfactory understanding of their research. One of the things I loved most about teaching IPS were the moments when students were given a challenge that was based on them applying the skills and knowledge they had acquired. Certainly the most significant one was the culminating “sludge test” that students were given at the end of the first semester. Given a flask with a mixture of solids and liquids, the students were challenged to separate and identify all of the materials in their solution. Typically, no two students got the same mixture, so there was no way to game the system and look at what someone else was doing. That kind of real application of knowledge by applying your understanding to a novel situation is the kind of culminating experience I aspire to organize for my students. 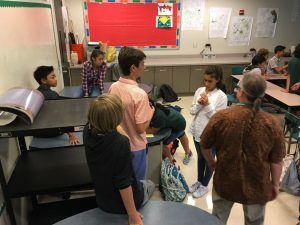 As I write this, it strikes me even more so how fundamentally my first teaching of IPS has affected my long-term view of science learning in my classroom. I certainly don’t win that battle every day, but I know the direction I am pointing, and that is already a better place to be rather than just following off-the-shelf curriculum. As we continued our work this week for our project on chemistry and conflict, our science class launched into a series of investigations into the properties of matter. Instead of everyone doing the same activity, which does insure that everyone gets to the same place, but limits how far we can go, we started the investigation of eight different inquiry labs that looked at reactions, physical properties, and other investigations about chemicals. All of these came from the excellent Vernier resource “Investigating Chemistry through Inquiry” click here. This work will take a couple of more weeks since we only have a couple of class periods each week to work on, but there is already been the starting of questions about what were seeing in the nature of matter which is a good place for us to be. We have also been having the students continue their research and build their outlines now that we have settled on either a podcast or a “TED”-like talk for their final presentation. While we have been working on this, I have been ruminating about some of the work that was part of my doctoral research. In the process of thinking about how learning happens, one of the phrases that I found valuable was the idea of knowledge construction. The description for each one of these principles is located here. (It would be a little bit long to include all of that on this post). A couple of examples may help explain what I’m thinking about. 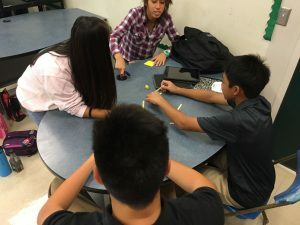 The principal called Improvable ideas we often see in our classrooms where students develop an idea or a notion that they want to act on, and as they try and implement they shape it and refine it through feedback from their peers and their teacher. Real ideas, authentic problems is centered in our work for MPX since we try and locate all of our essential questions around a real or authentic problem. Community knowledge matters greatly to us because it emphasizes the value that a community brings to understanding an idea and adopting it as a group. Considering all of these principles affirms and challenges the work we do in how we design our learning, and the ways that we observe how students construct and co-construct their meaning through transactional exchanges with each other. Over the course of this year, it is my hope to develop better systems to record this as it happens so that it can become a more powerful part of our assessment in the service of learning. Journal of Learning and Technology, 36(1).